I see we have a few new users! Stop by here and say something about yourself? Do you have any experience in Gameboy development? Wish you had? What's your dream GB application/game? My names Will. Most people on forums know me as disassembler. I make music with Game Boys using Nanoloop (1.2, 1.3, 2.x), Nanovoice, LSDJ and Trippy-H. I've always been interested in programming on the Game Boy, so that's why I'm here. Dream GB App: In 1997, Nanoloop was born. 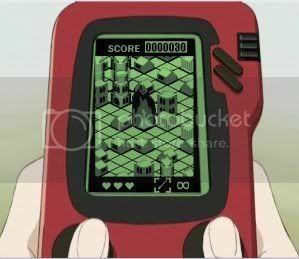 Dream GB Game: Fire Starter as seen in the series FLCL. It probably wouldn't involve too much programming. Fire Starter, you say. Tell me a bit more about that. That's ironic considering FirestARTer's MIDI box. I'll put FLCL on my must watch list! Firestarter (direct from the FLCL script: Firestarter. It's a hand held video game. No one knows how Endsville, the city of devils was created. But as soon as it appeared, it started to grow, and slowly eat up the world. You are an agent of Canti, God of the Black Flame. And you must stop Endsville from destroying the world. Your only weapon is flame. Matches, lighters, fire bombs. Get the weapons, out smart the fire fighters, hide from the police, and torch the city. You must be careful, you can not burn everything. When the entire city burns down, there will be no place to live. Thus, the battle is endless. There is no final justice. The only thing you can do is burn, and burn, and burn. Your highest goal, is to receive the personal blessing of Canti, the God of Black Flame. My icon is a shot of the game (sort of). The system itself was modeled after the Wonder Swan. It could either be implemented as a simple puzzle game with a reduced rule set, or a more complex strategy game in the style of Advance Wars and a more complex ruleset, possibly with multiplayer support. Thanks! I suppose that's what your avatar is? Hey my names Jimi Bullins, Most know me as smendrick around GB forums. Ive been making chiptune for about 2 months now with LSDJ, planning on getting nanoloop as soon as possible. Ive also heard about several other carts that im really interested in, although ive never seen them done, such as muddy gb, and other trackers put on a 32mb cart all in one. Im currently trying to get into modding gameboys, although it seems a little advanced, but one must start some where. As for modding GB's... Maybe I should make a section for hardware stuff. Hmm. It's bedtime for my part. I think a section devoted to Hardware mods would be great. I don't think painting the casing counts as a mod but I'm sure there will be talk of it so maybe a small section for that would be good? Also, a section for apps/games that have been developed, so links and discussions about them aren't all mixed in with the modding information? You can get a lot of ROMs from Herbert Weixelbaum's Game Boy music links page. I created a hardware section. I gotta run now, but in a few hours I'll add a stickied info thread with some useful schematics and stuff. My name is also will, I develop mostly in C# (because of my school projects) but soon hope to venture into more entertaining projects. I specialize in DBA and GUI development, I use lot's of SQL and as stated C# and visual basic. At home I use PERL,PHP and MYSQL. Oh yeah, and as a day job I fix computers mostly via remote access (pcanywhere). It's cool because these computers are all connected to the hospitals main HIS (admission system) so through the wonders of HL7 translation I get to handle these massive DB's from super famous hospitals from around the world like the MAYO clinic and such. The Advance Wars scenario might work. Or a simple puzzle game that never ends (like the plot of the game). Yes my avatar is a shot of the game. I've been looking for some better shots of it and some of the concept art etc... so far no luck. It's only in the series for a short while. From what the character in the series was doing while playing, it looks like you just use a d-pad to move and another button to set stuff on fire. Pretty simple game play. Hey Will! Come to Blip '08 this year! Hey there, I'm IIMarckus. Came here because I'm subscribed to the LSDJ mailing list. I'm not a chiptuner, but I've done some ROM hacking and thus have a little experience in GB programming. Great idea with a forum, let´s hope it will get really active. I don´t have the time for anything at the moment so i´m not really using the GB for music and such, however i have been trying to learn to program the gameboy (in C). I am studying computer science and communication. Hey, I'm Awol. People from 8bc know me as Grey_and_Purple (I'm trying to get my name changed to Awol over there too). I don't have any previous programming or development experience, but I am teaching myself C from a book I have. My interest in this stems from my interest in chiptunes. Right now I am using LSDJ, but I have been inspired by Pixelh8 to try and make some of my own music software for the Game Boy. I doubt that my dream application is even possible, but it would be cool to make a Game Boy into a kind of effects pedal that you can plug a guitar or some other instrument into and have a chiptune sound come out of it, so you could control the song live rather than tracking. EDIT: I also want to try some hardware mods, like pro sound, internal LED, backlight, etc. EDIT2: Also, thanks for making this place! It looks great so far, I'm sure it'll be really helpful, and it seems like it's starting up fast! I'm so excited, I can't wait ! Hello! Im Stu. I have always been interested in Gameboy when i was younger. (Weren't we all?) And this seems really weird, I had only a few days ago thought about the gameboy, and its hardware, programming. I go to college in Somerset England (a.k.a S***hole) and study Applied ICT (which is a mix of ICT things (websites, using paintshop pro!!! woo.., access, some programming) and an Oracle course WHICH FUNNY ENOUGH... oxygenfad: I think your doing the same course as me! I had signed up to this forum with the hope to learn and share information about hardware mods and programming. I would like to see what types of things a gameboy could do. Thanks nitro2k01 for starting this forum, good luck with its success. My Name is Thomas I collect alot of Game boy, GBP, GBC, GBA, GBM. I have done a little hardware modding like build a GBA SP into a original Game boy, and adjusable sun for the boktai games. But no more than that. I have allways liked to program. and especially for det gameboy. But all the times i have tryed to lean it myself, I have hit rock botton. I just don't understand it. Do you think you could post pictures of that GBA->GB mod? Yes I can post pic tomorrow, but its not finish only in a dummy shell, and gluede together.I want the final to be in a black shell. Are all the tranfere units via. paraelle port? is'nt there some that uses USB. Not at this point, but José Torres of 8bictollective is working on a really cool and promising USB project which will allow both cart programming of normal rewritable carts and a USB cartridge. Don't know how far down the pipeline that project is though. I am called Foona (in some forums im called Jngaelin) and i live in Sweden. I am a, mucisian, artist. producer and a DIY electronics knuckle head. When it comes to DIY electronics i make mostly stuff for my studio, musical purpuoses mostly. In my possesion i have a GB, a GBC and a GBA SP (Triforce version). i've have recently learned a bit about PIC programming but nothing usefull yet. Couldn't even imagine that being even usefull for BG aplications..
in my studio as a musical instrument(s). So i come here to learn from you, and mabye spur the innovation of harware mod options. Dream GB App: doesen't exist yet. I'll know what it is when i see it.. I am also a member of the Swedish Gameboy.nu forum. Last year i made a contribution to that forum and the GB world. It's a battery exchange guide. The language is in Swedish though, but the pictures speak for them selves.